On returning to Johannesburg after an intensive three-week lecture and printmaking tour of the US, Stephen Hobbs is buzzing with enthusiasm and filled with inspiration. 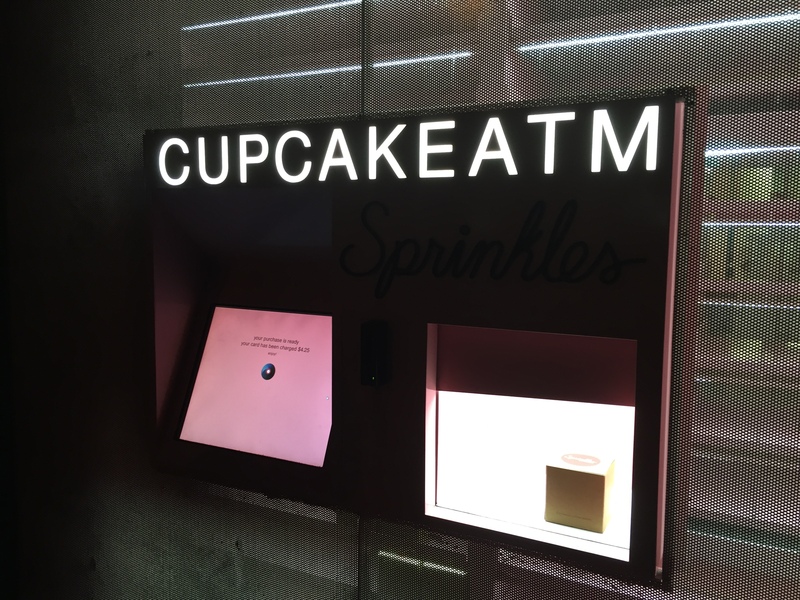 He spoke with our blogger, Jessie Cohen, to give a sense of what it was like to visit and make art in the so-called “armpit of America” (Detroit, Cleveland, St. Louis) as well as Connecticut and New York. With candid passion, Hobbs reflected that his trip was “a crazy idea of David [Krut’s] because it crunched so much travel and production into such a short space of time”. The tour was organised by Meghan Johnson from David Krut New York gallery, incorporating thorough fly-by visits to five cities in five different states, most of which Hobbs had never visited before. The fast-paced nature of the trip required Hobbs to digest city dynamics very quickly, sometimes operating with less than two days to lecture, make prints and orientate himself. Some might have found it exhausting, but Hobbs seemed enlivened by the momentum. The tour kicked off in Detroit, Michigan, where Hobbs gave a keynote speech at the Third Annual Detroit Design Festival in connection with the prestigious Penny Stamps Speaker Series, held at the University of Michigan Penny Stamps School of Art and Design. Hobbs spoke about defensive architecture in relation to his art (videos, installations, photographs and sculptures), in which he uses wartime camouflage painting to depict how urban planning can turn our cities into battlegrounds, as has happened in Johannesburg in connection with “white flight”. Click to watch Hobbs’s lecture, titled Defensive Architecture. 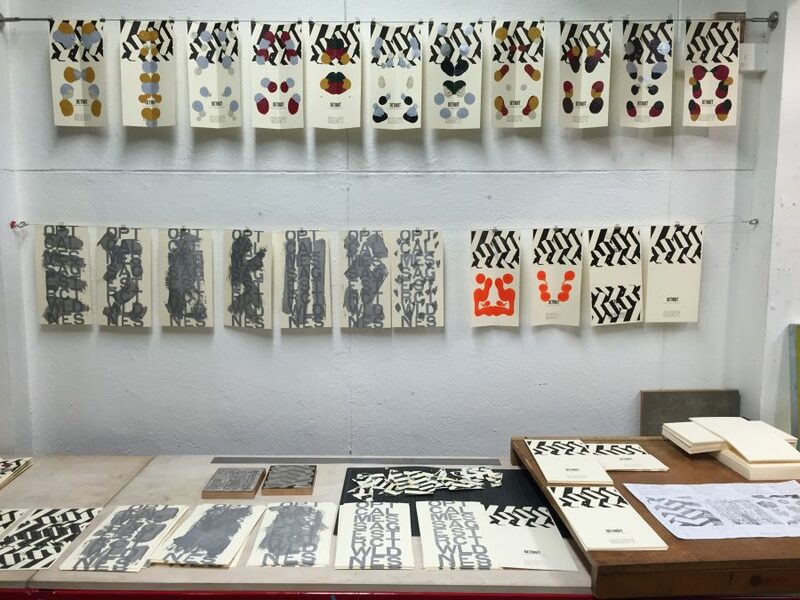 During his six-day stint in Detroit, Hobbs spent time at Salt & Cedar Letterpress, where he produced a series of letterpress prints, titled “Special Grids”. These experimental prints were executed organically as manifestations of Hobbs’s reactions to his new environment. Salt & Cedar Letterpress with printer Megan O’Connell. 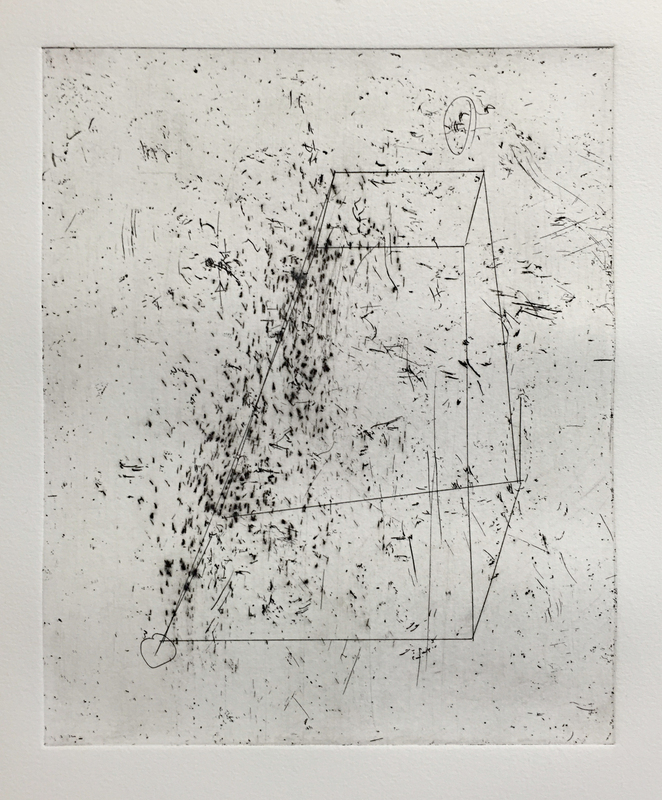 Editioning “Disposition”, one of four prints from the “Special Grids” series produced at Salt & Cedar Letterpress. 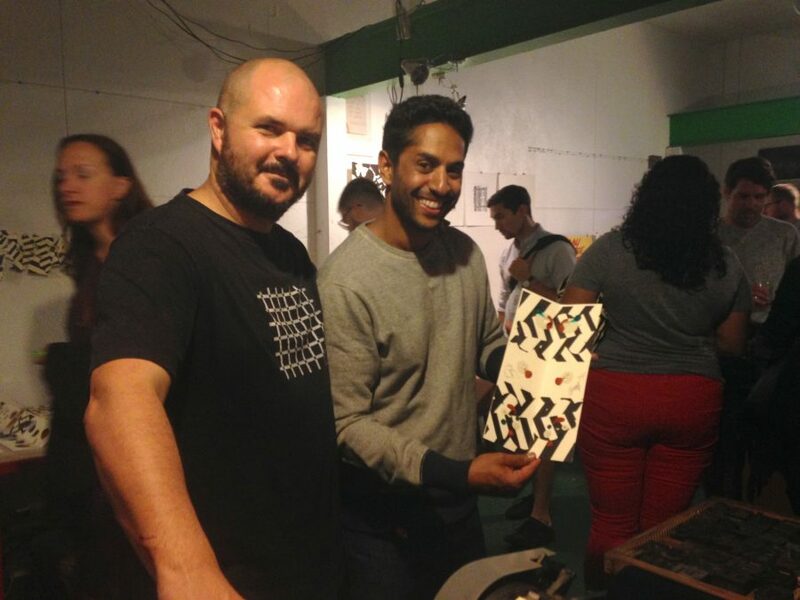 Hobbs: “Letterpress is a printmaking method which I hadn’t worked with before. When I arrived, I was overwhelmed by the range of typefaces. I gravitated towards already assembled words in the printers’ trays. I came across the words ‘Detroit’ and ‘heavy’. They chimed with me, so I ran with that”. 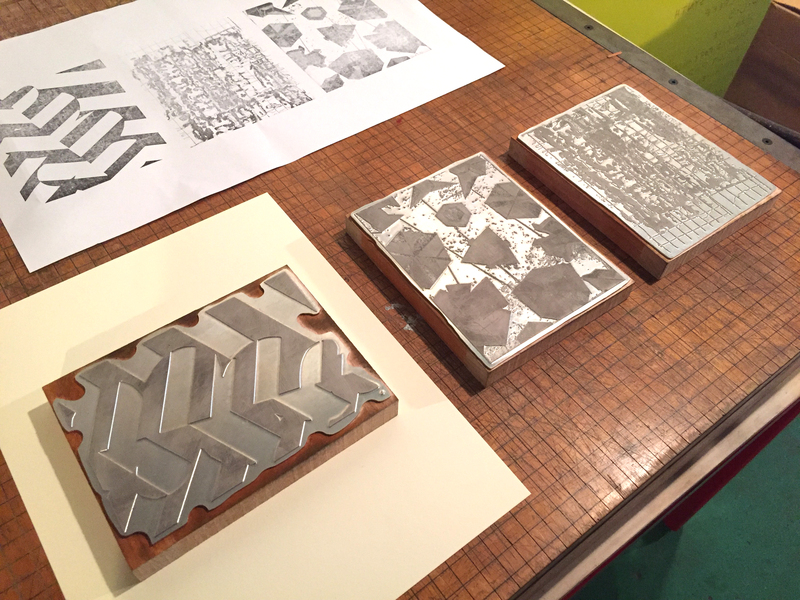 “Special Grids” in progress at Salt & Cedar Letterpress. 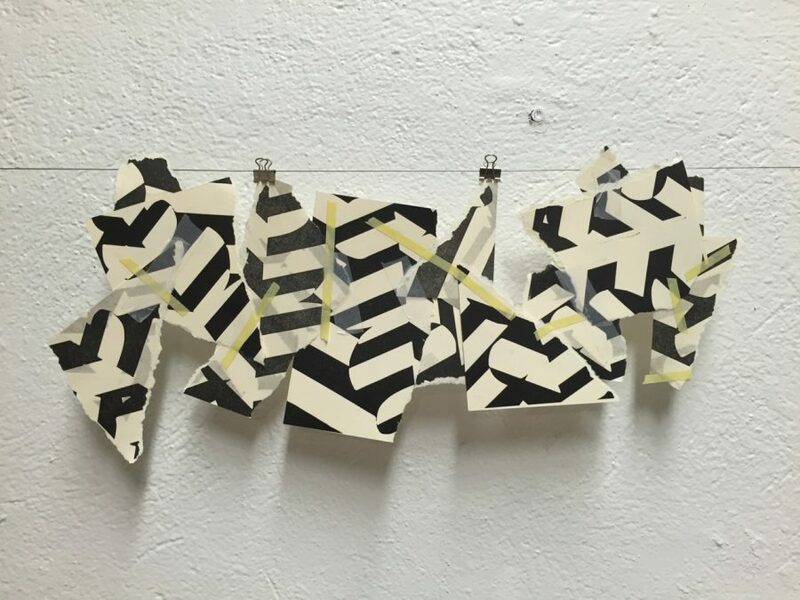 “Hobbs selected tangible and conceptual aspects of the city’s current state and merged these with imagery derived from dazzle camouflage, transmuted architectonic shapes, and geometric letterforms. Following the initial runs on a Vandercook SP15 cylinder press, Hobbs added to the substraits with heavy impasto paints, brushed or splattered pigments, and architectural drafting mediums. Taken as a whole, “Special Grids” defies conventions of printmaking, editioning, and notions of uniformity. 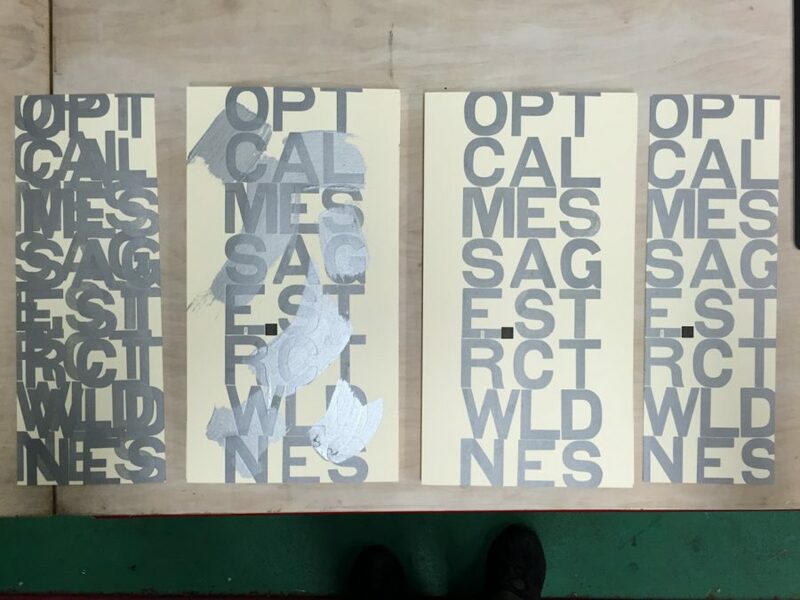 It traverses an array of histories, dimensions, and sites of contest, while pointing to the precarious state of cities undergoing radical physical change” – Salt & Cedar Letterpress prospectus on “Special Grids”. 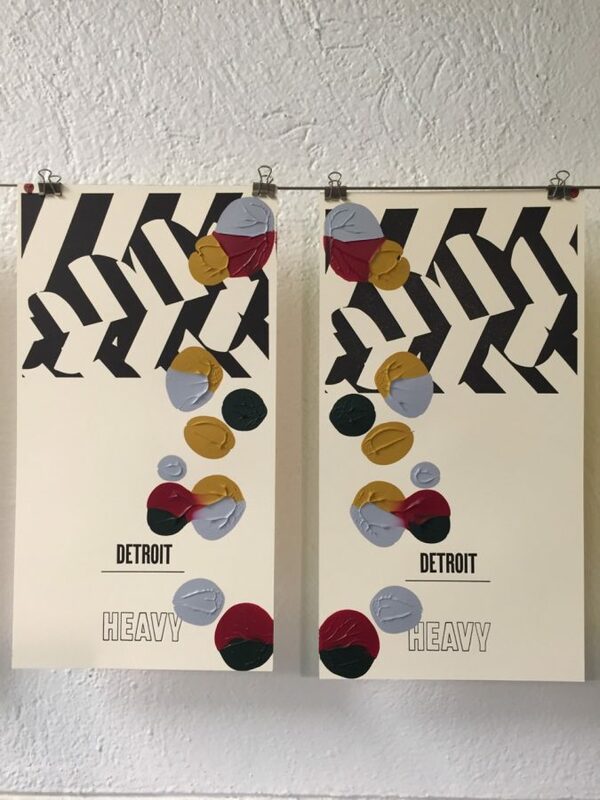 “Detroit Heavy”, one of four letterpress prints in the series “Special Grids”. 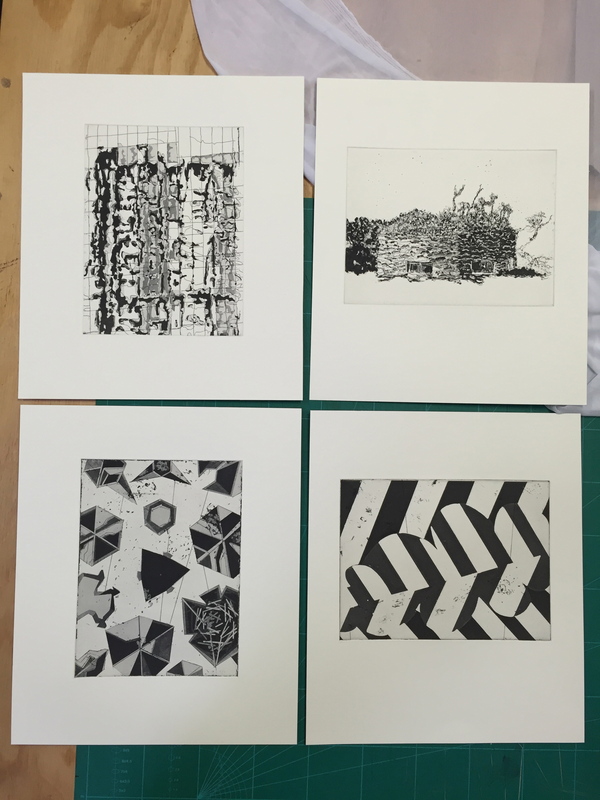 It is interesting to note that the “Special Grids” series is an extension of a previous set of prints which Hobbs recently made in South Africa with DKP master printer Jillian Ross at our workshop in Arts on Main. 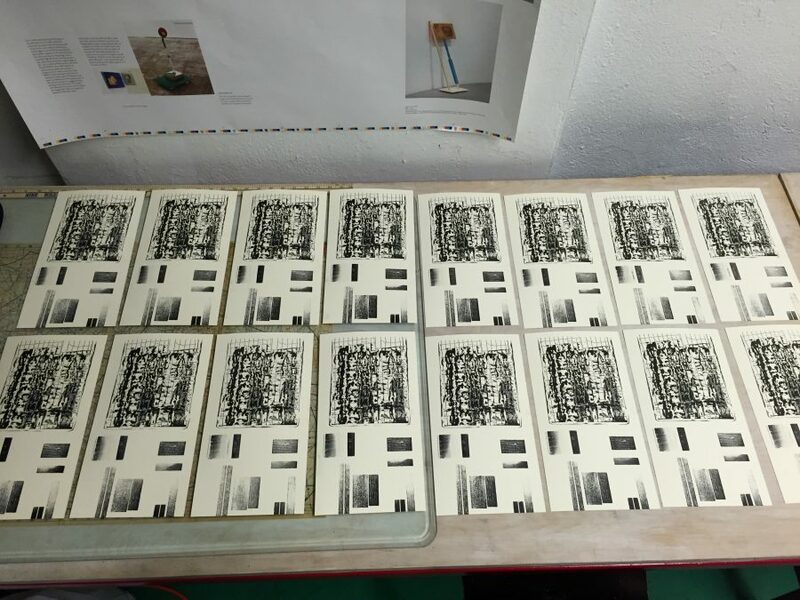 Hobbs selected a series of prints, titled “Buildings, bombs, bunkers and clouds”, to constitute the foundation images for his letterpress prints as a way of building up a dialogue on urban change between the two countries within his art. 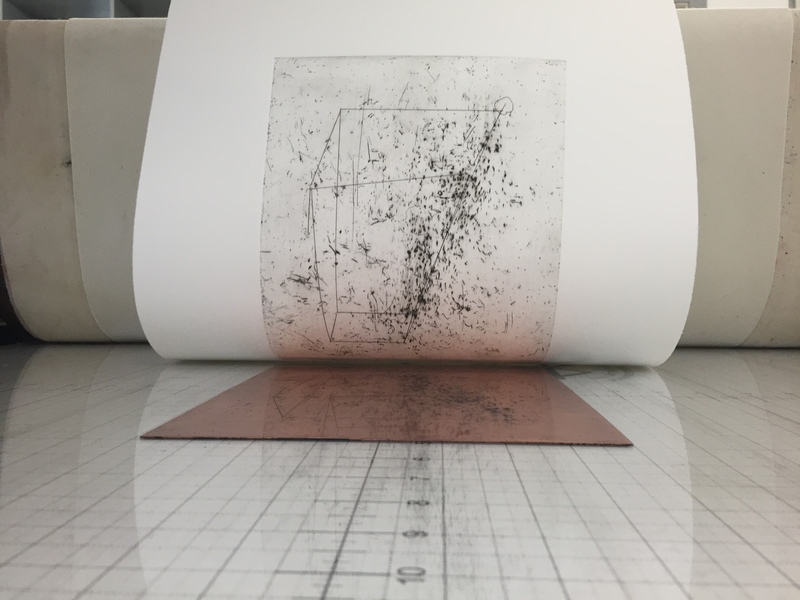 “Buildings, bombs, bunkers and clouds” is an edition of 15 prints with two artist’s proofs, recently shown at the Editions/Artists Book Fair (EAB) in New York alongside “Special Grids”. The technical process for using “Buildings, bombs, bunkers and clouds” involved translating the prints onto magnesium plates through photographic transfer. The “Buildings, bunkers, bombs and clouds” series was transferred onto magnesium plates using photographic transfer. Once the plates were made, Hobbs remembers the process as “completely improvised and never precious. Everything was done as a series of explorations”. As one of South Africa’s most well-known public artists, Hobbs is constantly alive to processes of urban change. In his printmaking, he tries to incorporate a light, direct style characteristic of his urban art. 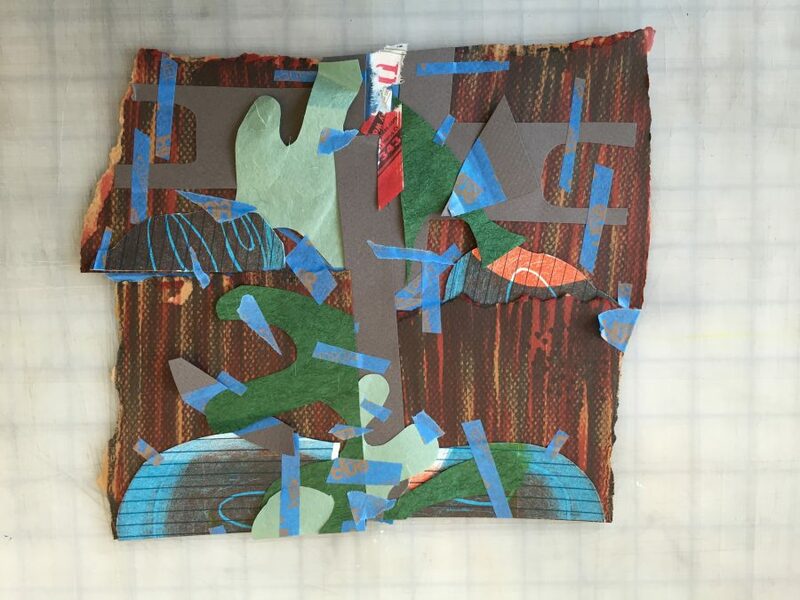 “Dazzle Cloud”, from “Buildings, bombs, bunkers and clouds”, torn up and re-assembled. 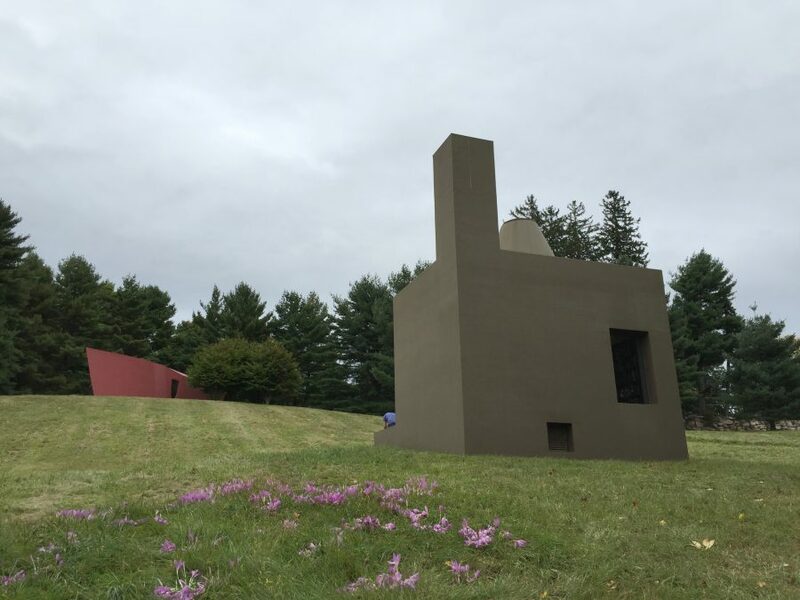 In the pipeline: Salt & Cedar were so inspired by Hobbs’s work that they hope to make “Dazzle Cloud” – from “Buildings, bombs, bunkers and clouds” – a mural on their exterior wall. This image is a mock-up design of the plan. 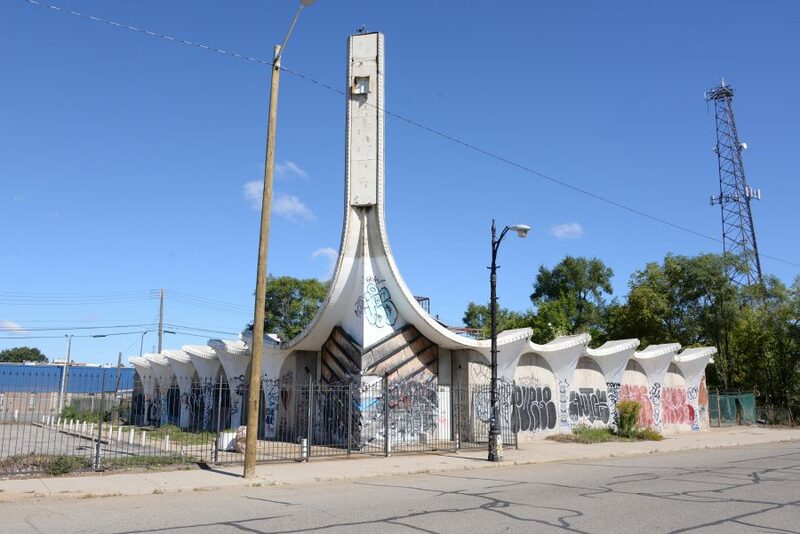 To orientate himself in a new city, Hobbs spent his first day driving across Detroit with Greg Baise, Public Programme Director at the Museum of Contemporary Art Detroit. 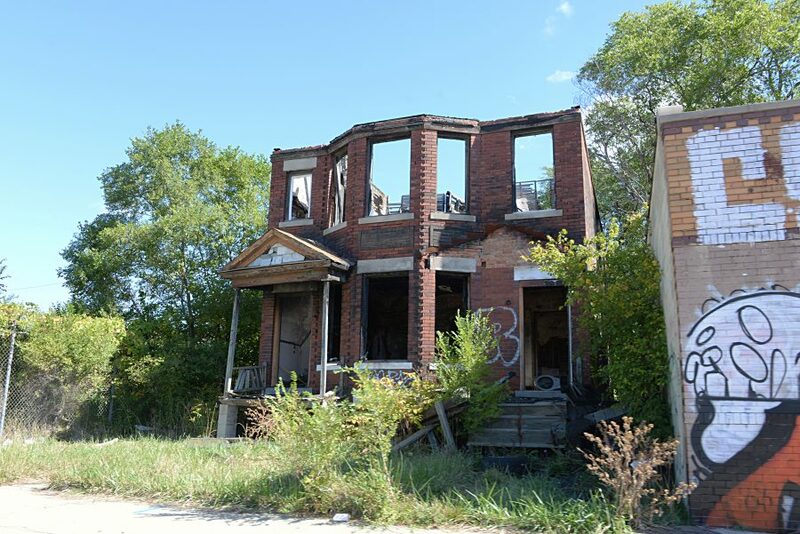 With Baise as a local guide, Hobbs explored the post-industrial areas of downtown Detroit, which gave him a sense of the urban sprawl. He also got a feel for distinct cultural areas, ranging from One Mile, the Irish suburbs, to various gentrified parts. Hobbs saw the drive as invaluable to his understanding of the city and how he produced work there. 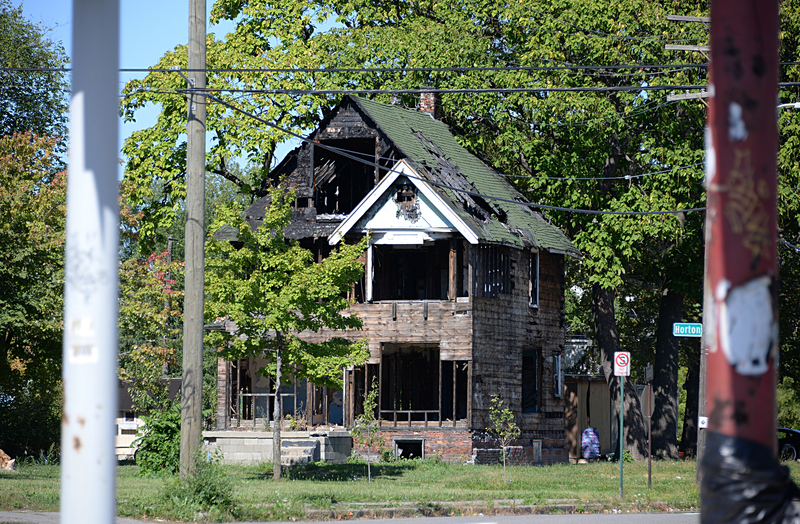 Hobbs was reminded of Johannesburg in terms of the tangible impact of white flight, which is also relevant to downtown Detroit. After a fascinating drive through Detroit, Hobbs chose to orientate himself in the same way when he arrived in Cleveland, St. Louis, and New York City – “cities built with the American Dream strongly in mind, and the remaining footprint of their rapid growth bears testament” – Hobbs. Hobbs’s “Special Grids” prints and Penny Stamps lecture were met with curiosity and positivity. He partly puts this response down to “a fantastic loop between the media, the marketing of the Penny Stamps talk series and the popularity of the Eastern Market which coincided with my visit”. 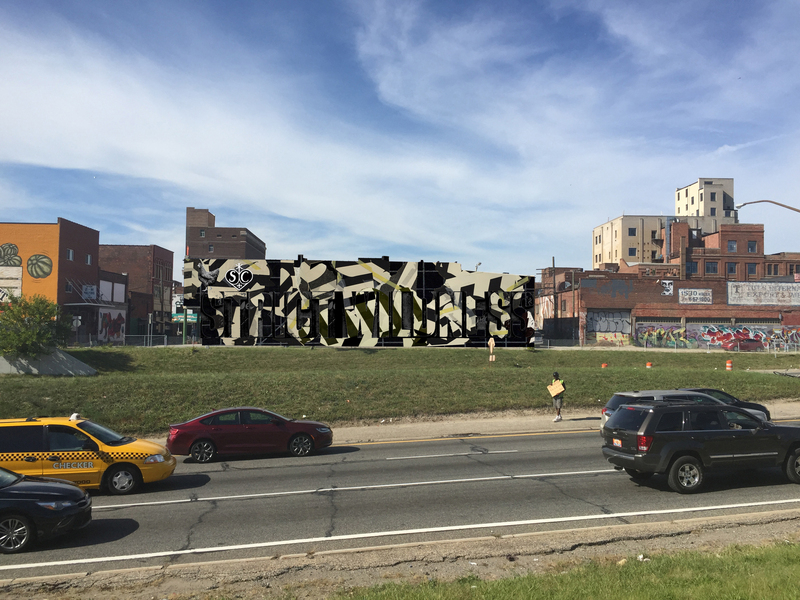 At the Eastern Market, locals appreciated that Hobbs’s style of art is not just studio-based, but directly engages the environment in which he works. After Detroit, Hobbs headed east to the wealthy state of Connecticut, New England. 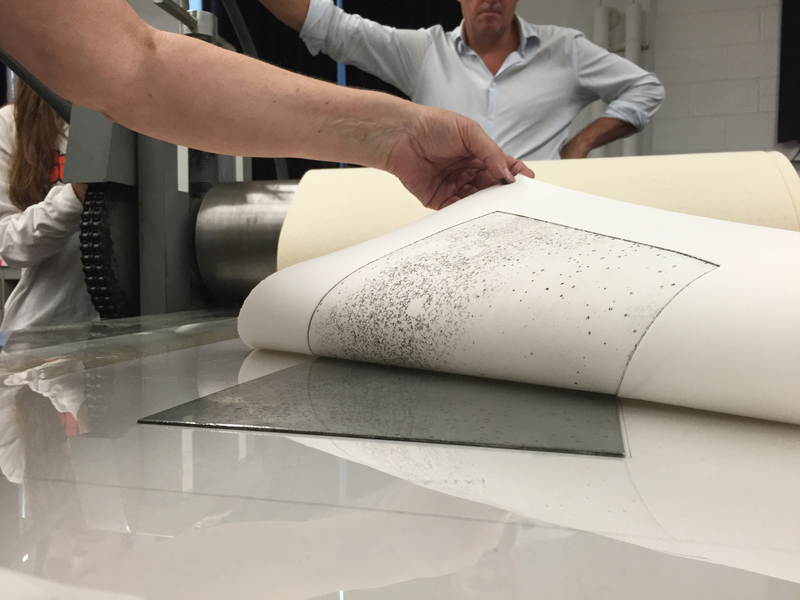 Here, he delivered a lecture and conducted a print demonstration at the Centre for Contemporary Printmaking (CCP). 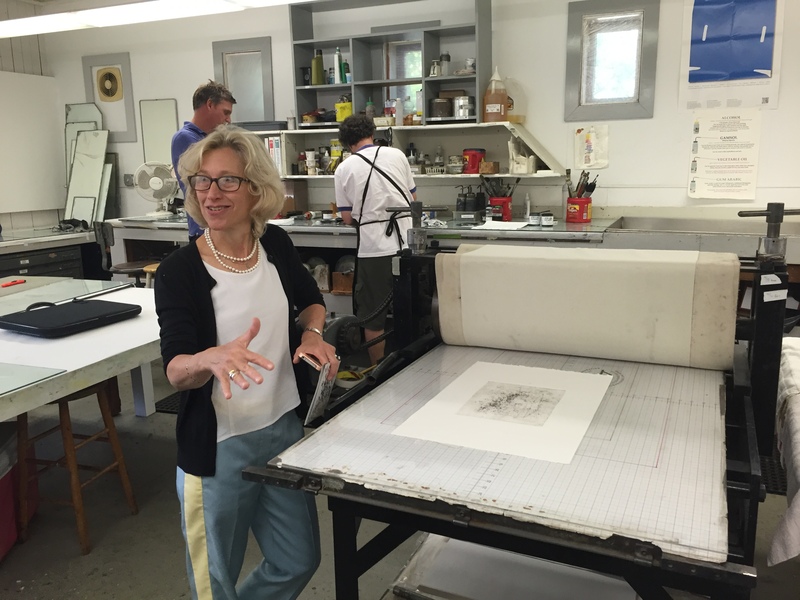 Laura G Einstein, Director of CCP, remarking on Hobbs’s print demonstration. Printing demonstration at CCP, using a copper plate. As yet, this work is untitled as it is unfinished. 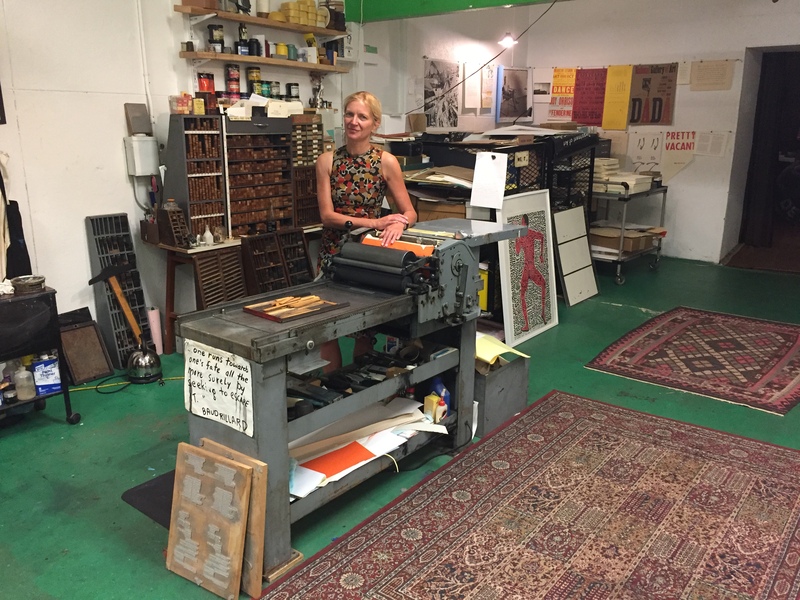 Hobbs will complete it with DKP master printer Jillian Ross at our Arts on Main workshop in the upcoming months. CCP Proof. Untitled at this stage. 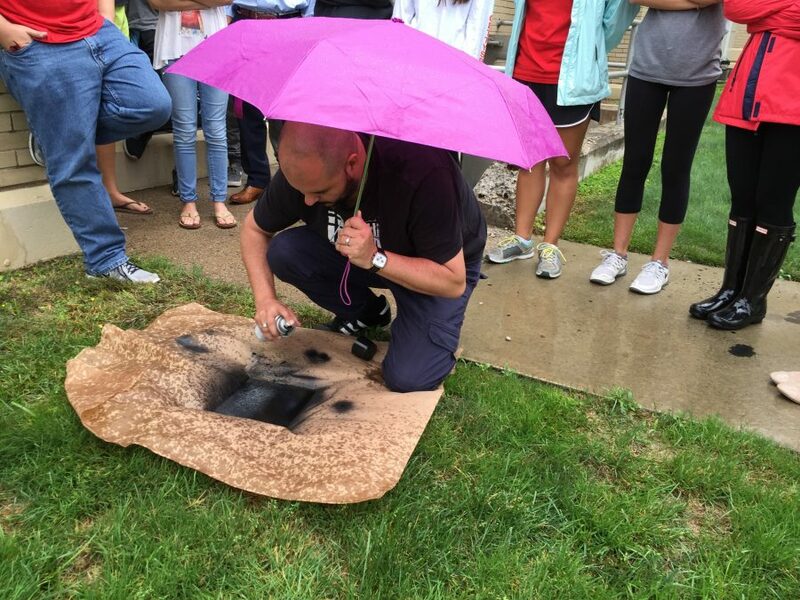 During his two-day visit, Hobbs also went to the Fine Art department at Fairfield University where he lectured on printmaking and did a print demonstration with the undergraduate students. 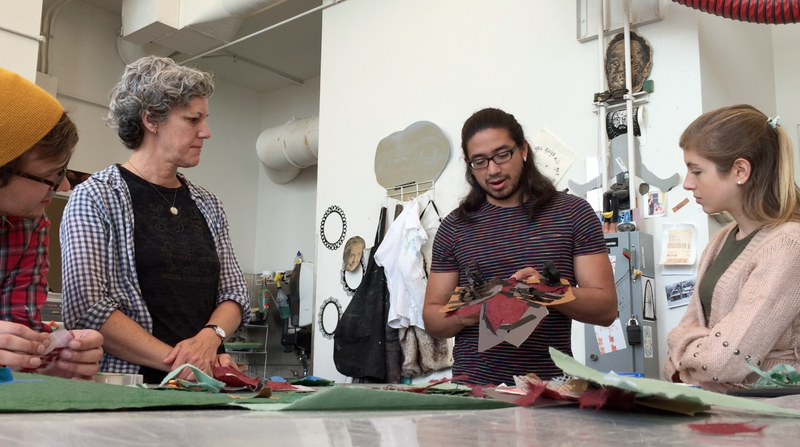 Hobbs with Professor Jo Yarrington, who teaches printmaking at Fairfield University. They produced and printed from a zinc plate. Avoiding the rain, Hobbs applied spray paint to the zinc plate in place of hard ground. 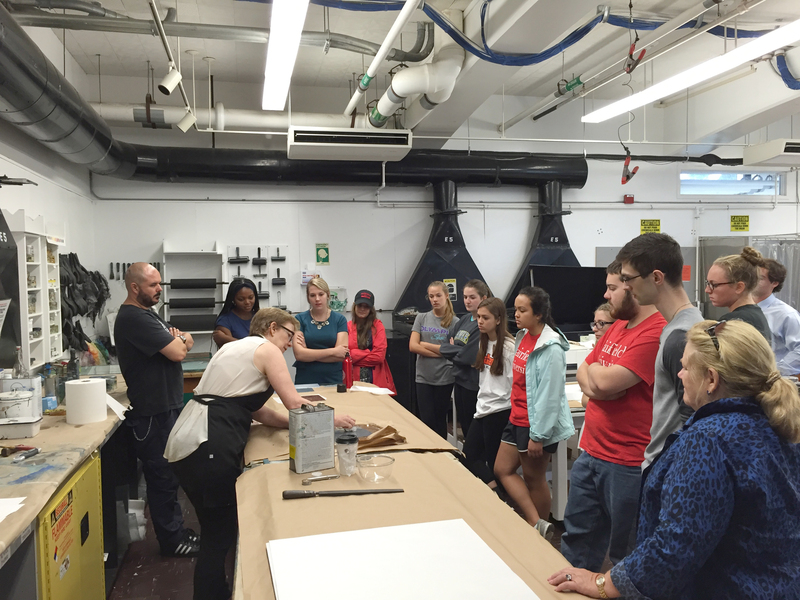 Printing demonstration at Fairfield University, using a zinc plate. 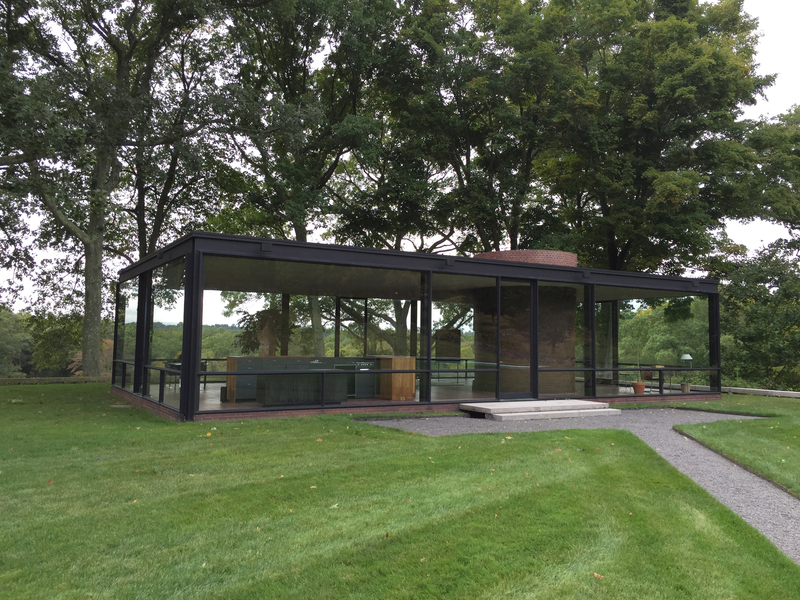 The iconic Philip Johnson Glass House, Connecticut. Hobbs was thrilled to be privy to this unique environment where a famous architect’s vision is located in a number of building concepts. The library building on Philip Johnson’s Glass House estate, Connecticut. Next stop: Cleveland, Ohio. 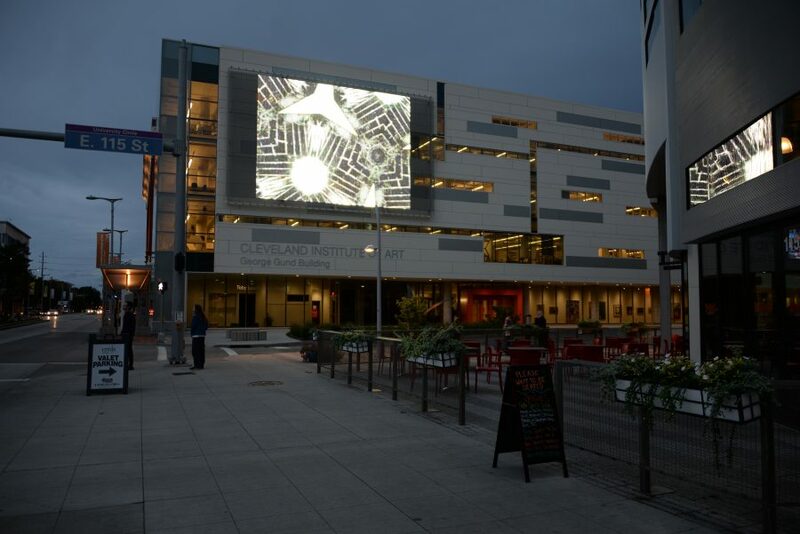 Hobbs stationed here for four days, during which time he went to the Cleveland Institute of Art to launch his media mesh screen that had just been installed on the side of the building and screened some of his work there. He also delivered a talk on urban change to the faculty. Cleveland Institute of Art: Hobbs screened a number of works from his recent video series, “Ghost Ships” (2015). 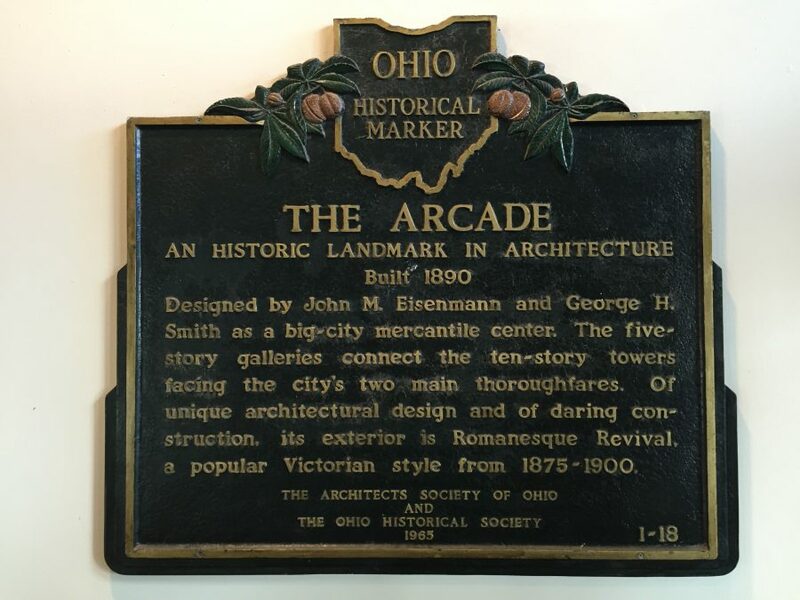 On the drive, Hobbs was shown the original arcade in downtown Cleveland. 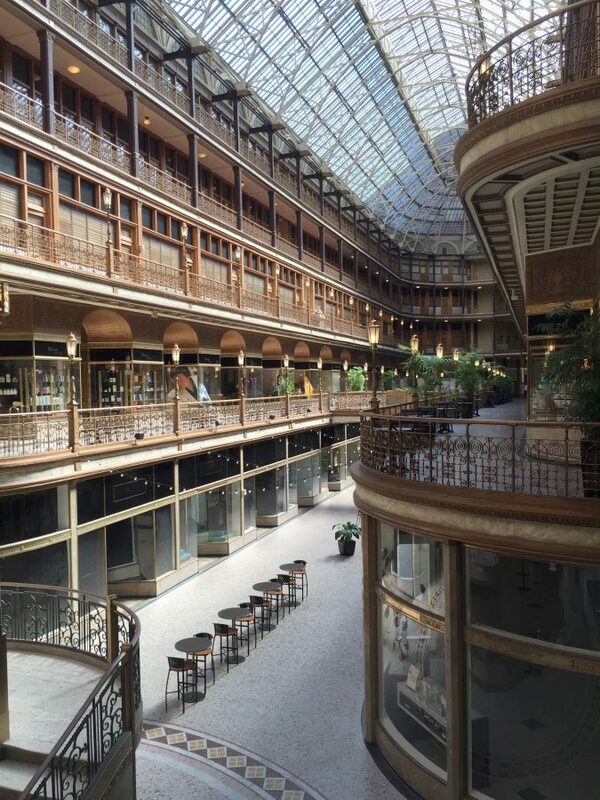 The Arcade, Cleveland – a landmark building from the 1800’s. Hobbs on The Arcade: “This type of architecture is reminiscent of a similar period of retail interior design that we see in Johannesburg – a style which originated from Paris.” The typically busy building was quiet as Hobbs went on a Sunday when shops were closed. On arriving in St. Louis, Missouri, Hobbs had just one and a half days to orientate himself, deliver a lecture at Washington University and do a print demonstration with the students there. Orientating himself first, Hobbs paid close attention to signs of regeneration and decay. 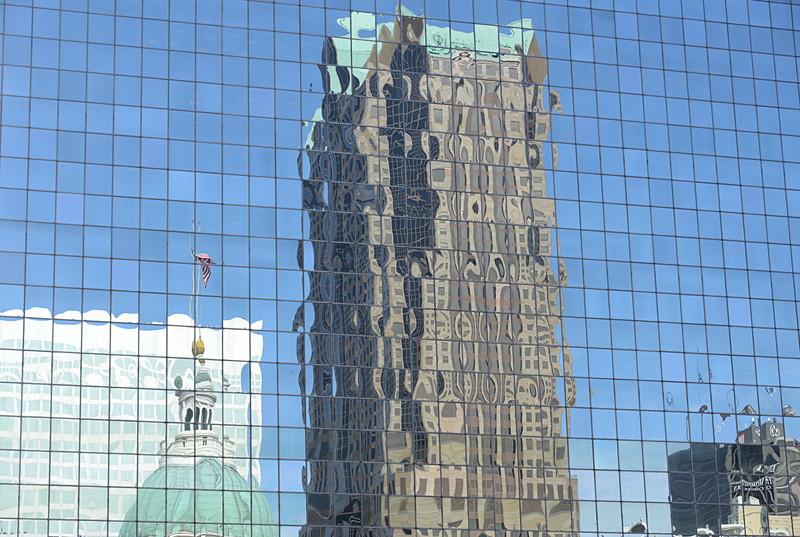 Driving through St. Louis: “These photos are very much part of my early photographic enquiries into building and light reflections and how these read as camouflage” – Hobbs. This enquiry started for Hobbs in Johannesburg in the mid-1990s. 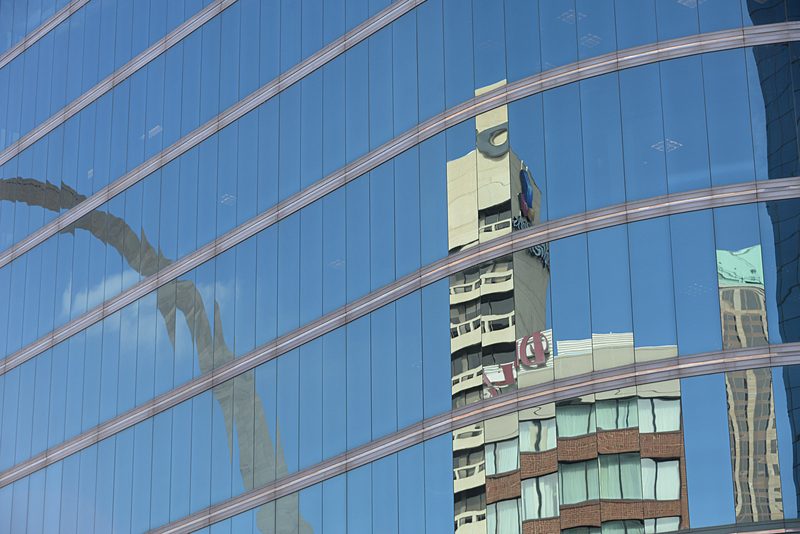 This St. Louis skyscraper with reflective windows tapped into Hobbs’s fascination with urban regeneration and camouflage. 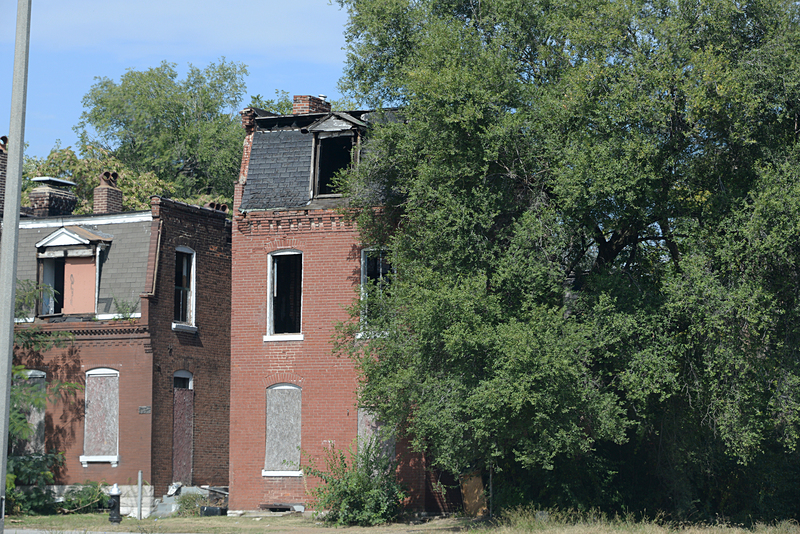 While driving through other parts of St. Louis, Hobbs witnessed a very different vision for urban development. Together with Washington University’s Professor of Art, Lisa Bulawsky, Hobbs conducted a workshop at the university. He instructed the students to create a narrative of their own city using collage and a personal take on camouflage. Hobbs did a workshop at Washington University with, Lisa Bulawsky – Professor of Art at the university. On his last day in St. Louis, Hobbs met local journalist Eileen G’Sell for a three-hour walking tour of the city. The remains of Pruitt-Igoe, St Louis. According to Hobbs, Pruitt-Igoe became a “violent gang land as a result of social and economic decline in the area.” Eventually, the entire building complex was demolished, leaving a giant urban forest in its wake. Hobbs’s roller-coaster ride through five states ended in New York City, New York. He gave a talk at New York City College, where he noted “the university had fortress-like architecture with beautiful gates opening into the city”. He appreciated its Harlem location, for which he attributed the university’s “cultural richness and diversity”. Here, Hobbs engaged graduate students on their work and visited their studio spaces. He saw that many were dealing with similar themes to South African students for whom identity politics is a key concern. 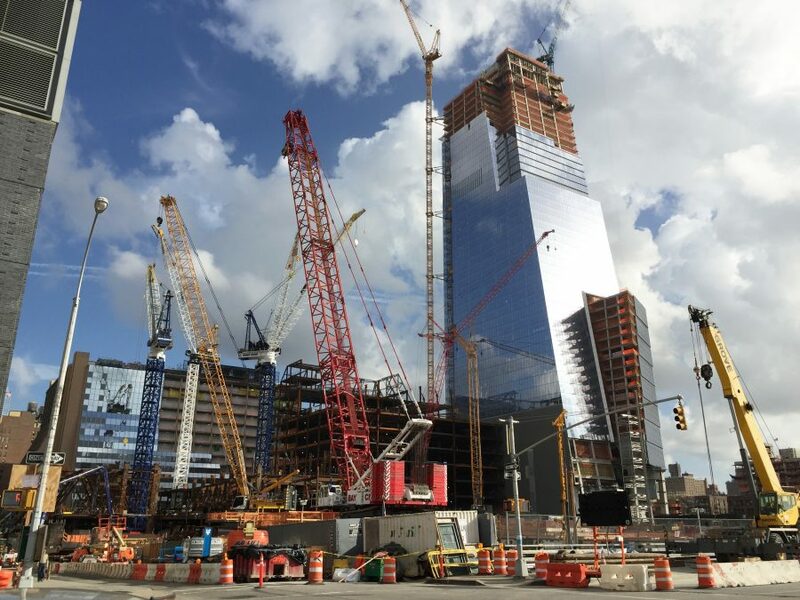 While in New York, Hobbs was drawn to his old favourite: buildings under construction. 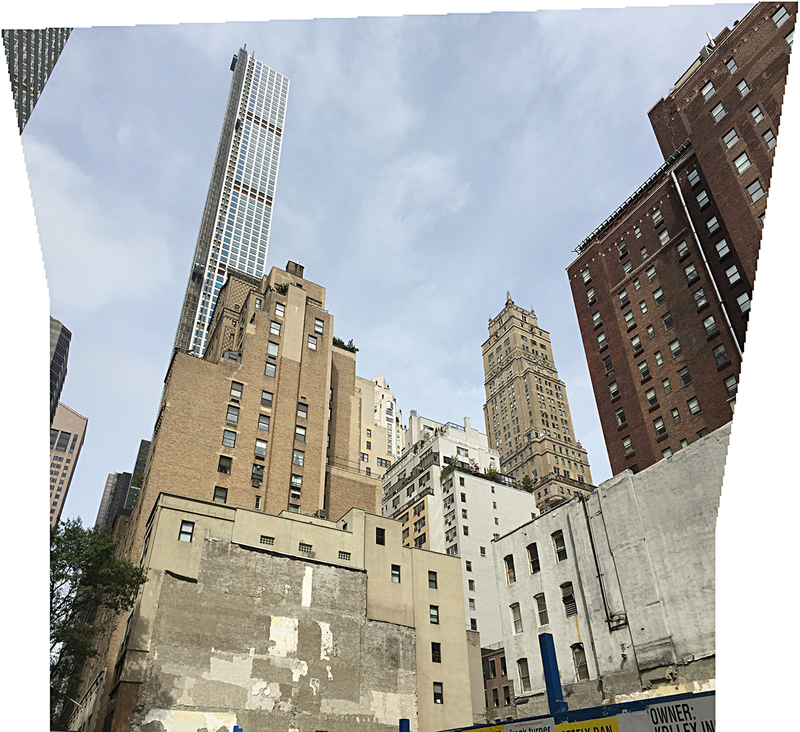 This ironic shot, taken in midtown Manhattan, depicts the extent of development and privilege in parts of the city. Thinking back on his overall experience, Hobbs reflected that “America has a simple narrative of social change. In essence, they got greedy. Companies got rich, they over-expanded and over-built and then just disappeared. It’s a very different economic paradigm to South Africa, but the similarities between our social geographies are there and need to be unpacked”. As we neared the end of our conversation, Hobbs leaned forward and looked me square in the eye. “Ultimately”, he asserted, “in and amongst all the travelling, lecturing and printmaking, the real work was building foundations between institutions on an important subject. I was there to provoke a much-needed conversation on the role that art plays in urban change”.